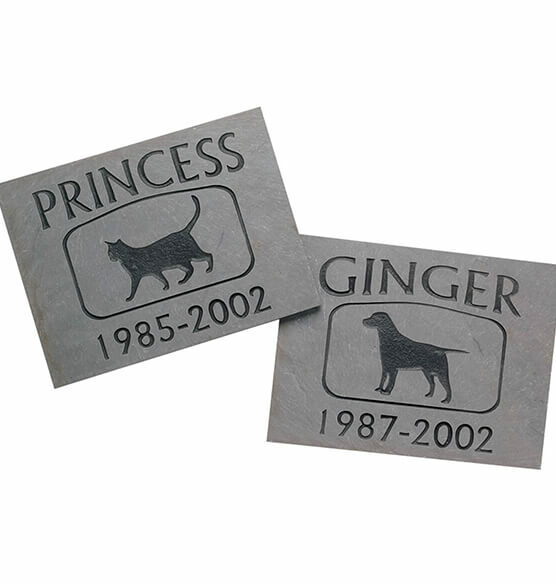 A lasting memorial for your beloved cat or dog. A Miles Kimball exclusive, this personalized pet memorial is genuine sand-blasted natural Vermont slate. Pet memorial stone mounts flush on the ground, personalized with your pet's name and life years. Specify cat or breed of dog - for dogs, over 150 AKC breeds are available, we will place appropriate picture in center (if mixed breed, specify what breed the dog looks most like, and we'll choose a near match). Specify 2 lines of personalization, name and life years, up to 10 letters or spaces per line. Custom pet memorial is 6" x 8". Allow 3-4 weeks, express shipping not available. On the small side, but a beautiful memorial for our beloved dog. The etched breed on the slab was perfect. Thank you! We ordered 4 engraved stones to always remember and memorialize our precious kitties by placing them outside on their grave sites. They are beautifully done. I am hopeful that they will remain in good condition for years to come. It matches two others from 2002 and 2005. I'm glad you kept it the same. Thanks, the product is of good quality and was delivered in a timely period. Needed a memorial plaque that was ground level so I could mow grass over it. This is excellent and just the right size. I love the way the name and dates are engraved along with the engraving of my dog. Only comment is that the Corgi body is a bit too long, but OK. The one my son got for his Newfoundland is just perfect. Nice pet memorial. We've purchased others before in previous years and they have proven to be durable in all kinds of weather, so was happy to see that you still carried it. Product was beautiful a great memorial for our dear girl. IT was much higher quality than expected for the price. I am more than satisfied. This is the second time we've purchased! This is the second pet memorial we have purchased. It is exactly as advertised and works very well for us. We will contine to use this product every time we have a pet loss. It helps to remember all of the good times you had with yoour beloved pet. This marker was perfect to mark my dear Gabbie's final resting place. I will always have a place to go to visit her. Surprised and very pleased how nice the stone is and also the quality of the picture and the lettering. I ordered 2 for starters, and then I ordered 2 more. They are small enough to not his with your lawn mower, the black lettering is attractive. I love my Lucas pet memorial stone. It has all the information on it and a outline of him. plus its small. I've been looking for a classic memorial to honor the memory of Kate, our family dog of 15 years. Nothing cutsy or whimsical, just a fitting memorial to a dog who meant the world to us. When it arrived, I was overcome with memories and very grateful for the detail and quality of workmanship that went into producing her marker. It will last for years and serve as a gentle reminder of her and the life and love she generously chose to share with us. We received this product in a timely fashion and were quite pleased with it. We placed it in the garden as it's a perfect way to memorialize our beloved kitty at his gravesite. It looks very natural and seems durable. I looked at several websites before ordering this. This was exactly what we were looking for and at a reasonable price for the quality. This is our 3rd pet memorial. A lasting memorial of our pets. This is the second marker stone we ordered from Miles Kimball. We looked at other memorial markers on various websites and you will not find a better stone (not plastic!) memorial for your pet. We were very pleased with the marker and the price. I ordered our first memorial to be sure it would meet my expectations. These are well made and the engraving is deep. The black highlight of the dog symbol and dates may not hold up over time, but they should still be legible. I was so satisfied with the first, I have since ordered an additional two memorials and will order more. These are pricey, but should hold up better than most other memorials offered. Such a nice way to show a pets legacy.. I have a small pet cemetery and am getting these for each grave. Please bring back earlier memorial (polyresin w/ verdigris finish). It allowed for better personalization in that both date of birth & death could be engraved. Also, as mentioned this is limited to dogs & cats. I have pets of other species as well. What do I do when one unfortunately passes? Oh yes, I much prefer the other markers (been purchasing them for 20+ years). I do not see a place on your site to personalize this. How do I do that? BEST ANSWER: Thank you for your question. We suggest you call our Customer Service department at 1-800-572-5750 for further assistance. We hope this information will be of help to you.